No doubt, the people sharing this message have the best of intentions, but it is absurd to think that Facebook would give anyone or any cause 3 cents for a Facebook share. Hoax-Slayer confirms that this photo has been in circulation before, and the medical condition is likely not even a tumor at all. The origin of the photo is unknown. 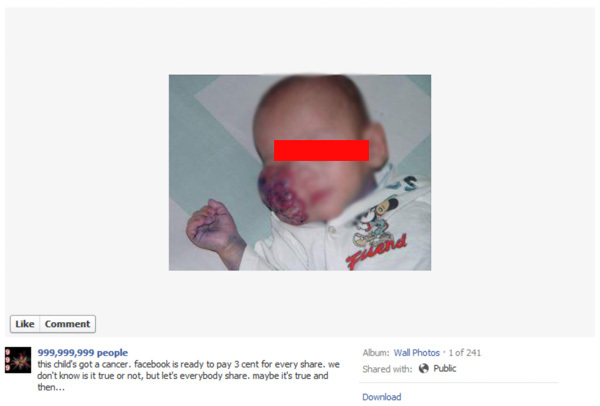 We have seen several hoaxes in the past that offer to pay for each Facebook share or like, or email or text message forwarded. We have yet to see any legitimate fundraising effort utilizing this method. If you or your Facebook friends are falling for tricks like this, it’s time to get yourself informed of the latest threats. Be sure to join the Facecrooks community of over 120,000 fans on Facebook to be kept informed of the latest Facebook hoaxes, scams and security issues.